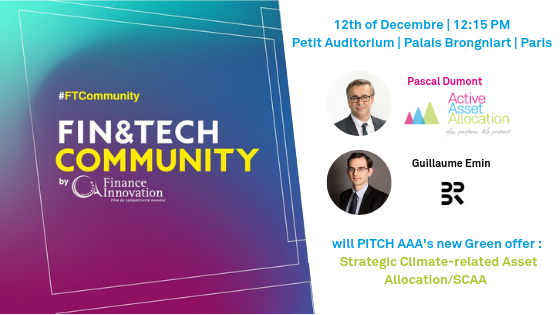 Pascal Dumont, Institutional Sales Director and Partner at Active Asset Allocation will take part at FIN&TECH Community event on the 12th of Decembre 2018 in Paris. Organized by the International Competitive Cluster Finance Innovation, the event will take place at Palais Brongniart. Pascal Dumont will be at the “Petit Auditorium” at 12:45 to pitch AAA’s new Green Strategic Asset Allocation Tool : Strategic Climate-related Asset Allocation/SCAA . Created with the aim to offer market players a new tool for strategic asset allocation integrating climatic constraints, this tool was developed by Active Asset Allocation, in partnership with the financial rating agency Beyond Ratings, who will also take part in the pitch, represented by Guillaume Emin. The Pitch that should last about 12 minutes, after which the two speakers will be available to answer questions and queries regarding this new offer.